Telegram is raising up to $2 billion to develop a messaging and commerce platform on a new blockchain. Tech investors are split on whether the investment is a can't-miss opportunity or the scam of the decade. One crypto investor writes: "I certainly would not put a single cent I care more than nil about losing into this." Woody Levin left his gig as vice president at software company DocuSign in early February to start a crypto hedge fund. As a full-time cryptocurrency investor, he now has one primary source of information: Telegram. With close to 200 million users worldwide, the Russian-created secure messaging service Telegram has become the universal communications hub for crypto enthusiasts like Levin, whether for sharing news and tips or marketing a token sale for a new niche project. "Telegram is my crypto world," said Levin, whose San Francisco-based firm has about $25 million in assets. He used to have Facebook open constantly in a tab on his web browser and would check it periodically throughout the day. Telegram has replaced it. "It's one of the first things I check in the morning and one of the last things I do at night." After serving as the communication platform for token sales and ICOs, Telegram is now gearing up to take full advantage of its popularity in the crypto world. The company is planning a 2018 ICO that may be almost 10 times the size of the biggest crypto deal to date. Investors who follow the deal tell CNBC that it's aiming to raise up to $2 billion. It's a highly ambitious endeavor — and one of the most polarizing topics in technology. Supporters see the Telegram ICO as the blockchain investment of the century and an opportunity to back a product that poses an existential threat to Facebook. But skeptics believe the company is bilking investors out of billions of dollars based on marketing fluff and a heavy dose of FOMO — fear of missing out. "You could see how people would say this one checks all the boxes — amazing team, a market set up for them and a good product," said Travis Scher, vice president of investments at Digital Currency Group in New York. But Scher said that his firm isn't investing because "the numbers are totally out of whack." A Telegram representative didn't respond to requests for comment. Unlike an IPO, which gives investors stock ownership in a company, ICOs provide tokens that their sellers promise will be useful in a new digital network, once it gets built. Virtually non-existent until last year, ICOs raised over $4 billion in 2017, according to Autonomous Next. The biggest offerings — Filecoin and Tezos — each brought in over $200 million. Telegram was founded in 2013 by Russian brothers Nikolai and Pavel Durov, who previously started Russian social network VKontakte, sometimes called the "Facebook of Russia." Today, it's a messaging platform like Facebook Messenger, WhatsApp or WeChat and is known as an easy place to create group chats and for its focus on encryption and privacy, protecting conversations from being viewed by outsiders. The service gained popularity following the Edward Snowden revelations about U.S. government surveillance and has since been used by ISIS and other terrorist groups to disseminate information. It's moved headquarters several times, according to its website, and is now housed in Dubai because of Russia's heavy-handed approach to online censorship. It is "ready to relocate again if local regulations change," the site says. Many people in the crypto community have flocked to Telegram because of its libertarian roots and because it spurns advertising — the business model that drives Facebook, Twitter and Snap. "Telegram users are really at the epicenter of the whole crypto boom," said Ryan Gilbert, a partner at Propel Venture Partners, which invests in financial technology. Now, it's selling investors on the idea of a futuristic blockchain-based messaging system that, if all goes as planned, will be up and running by 2021 and create a "VISA/Mastercard alternative for the new decentralized economy," according to a primer published online. Telegram's development team is slated to receive 4 percent of the tokens with a four-year vesting period. 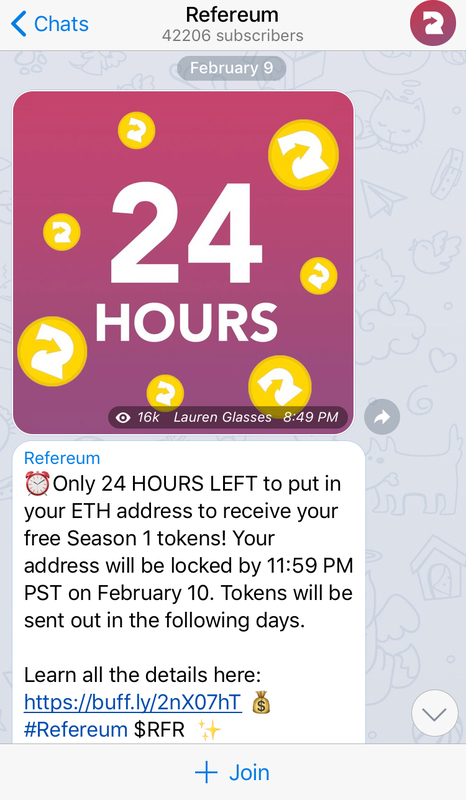 The future, according to the company's marketing materials, is the Telegram Open Network (TON). It will be built on blockchain's distributed ledger technology, and will allow app developers, publishers and content creators to earn coins — called grams — and use them to transact. Grams, which have a finite supply, will theoretically rise in value as more people use them on the network and as demand for the currency increases. The vision is compelling to many in the tech industry who think that centralized giants such as Facebook have way too much control over the online experience. They imagine a new virtual world with a wide range of digital and physical goods being bought and sold, but with no controlling institution in the middle selling your data and tracking your every move across the web. No bots sending fake news. No ad retargeting. Facebook, Amazon and Google "are really just collecting rent on our information," said Levin, who sold his former start-up to DocuSign in 2015. "At some point, that's going to shift and people are going to demand to be included in that rent collection. You can incentivize individuals to participate in the ecosystem and reward them financially." It has the aura of a digital utopia. But Telegram's ability to get us there is very much in dispute. To date, Telegram has been funded by Pavel Durov, who four years ago sold his 12 percent stake in VKontakte for reportedly around $300 million. His development team has a proven ability to build and scale large social platforms. But creating a whole new blockchain, with all the encryption, security and infrastructure required, is an entirely different undertaking. Because it's decentralized, a critical component to crypto development is something called a consensus mechanism, an automated way of maintaining order and establishing and enforcing rules within a blockchain. For example, bitcoin has a consensus algorithm called "proof of work" that ensures a single version of the truth. "The teams that will win are teams with deep historical context who have been tinkering with consensus mechanisms and scalability for several years. It's more like science than entrepreneurship," said Nick Tomaino, the founder of a crypto fund called 1confirmation. Of Telegram, he says, "In my mind, they don't have the talent to do that." Charles Noyes of Pantera Capital is similarly skeptical — and far less polite. In a recent blog post, Noyes, a quantitative trader, called the Telegram ICO an "opportunistic ploy" and described the project's 132-page technical whitepaper as "essentially a wishlist of things they want to have, and how it will work assuming that their wishlist doesn't crash and burn." Noyes wrote that Telegram's approach is "incompatible with blockchain technology," and said that as an investor, "I certainly would not put a single cent I care more than nil about losing into this." Despite such warnings, Telegram is having no problem raising money. Most investors who spoke to CNBC for this story said the offering is oversubscribed and could value TON at up to $5 billion. According to a story last month in Recode, big-name venture firms including Sequoia Capital, Benchmark and Kleiner Perkins Caufield & Byers are participating in the deal. However, Andreessen Horowitz and Union Square Ventures, which made early bets in the crypto space, have taken a pass. Telegram has already raised institutional capital in what's called a presale, luring big investors who are willing to commit at least $20 million. Those backers, who will put in up to $850 million in total, are getting in at a steep discount (40 to 60 percent) to what it will cost retail investors when the public sale begins in coming months. But unlike a typical venture deal with a corporate governance structure in place, investors don't get a board seat, voting control or shareholder protections, and they hold no equity. To avoid a regulatory tussle with the Securities and Exchange Commission, which has essentially defined ICOs as offerings of unregistered securities, several investors told CNBC that Telegram may make the retail piece available only to people outside the U.S.
Blockchain Capital, among the first crypto venture firms, is steering clear of the ICO. Spencer Bogart, a partner at the San Francisco-based firm, said a representative from Telegram met with his team in December and walked them through the whitepaper. He said there's an "illusion of exclusion" to the offering. "It was an absurd valuation for something that's effectively field stage," said Bogart. He said the pitch is having more success with traditional venture firms who've missed out on crypto to date — particularly bitcoin, ethereum and companies such as Coinbase — and are feeling the pressure to get in on the craze. "Their limited partners are calling them saying, `What are you doing? This is the biggest airball in venture history,'" he said. There's also a more cynical reason to stay away from Telegram. In 2017, the company's annual budget was $70 million, bringing its expenses over four years to $171 million, according to the ICO primer. That's almost all coming out of Pavel Durov's pocket, and the figure is only getting bigger, rising to $100 million this year and $220 million by 2021. Telegram said the funds raised will go toward the "development of Telegram and TON and for the ongoing expenses required to support the growth of the ecosystem." In other words, investors in the ICO will hold tokens in a network that's yet to be developed. But in the meantime, they're paying for the wages, office space, infrastructure and legal fees that go into the upkeep and growth of the existing Telegram service. Telegram could grow from 200 million users this year to 675 million in 2021, its marketing material suggests. But if TON fails to spawn a vibrant marketplace, the grams that investors purchased will quite likely be worthless. And all the equity in the company will still be owned by the founding team. "It really felt like it was one of these start-ups that's burning through cash and needs a way to bring money in to keep funding their operations," said DCG's Scher. "This is how they decided they're going to do it." — CNBC's John Shinal contributed to this report.